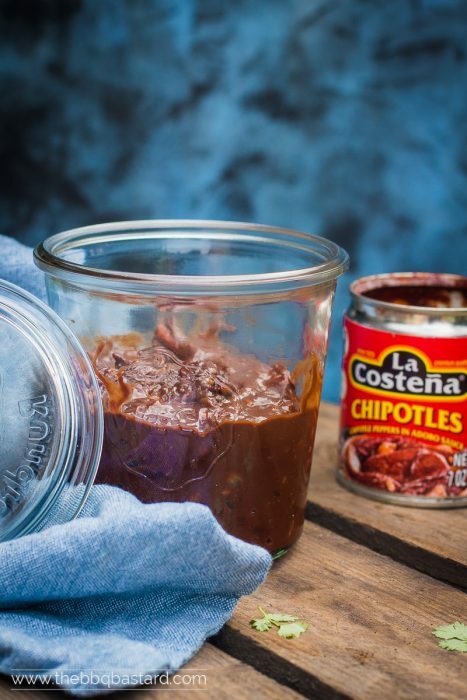 The Mole Poblano BBQ sauce finds it origin in the traditional Mexican national dish. Translated Mole Poblano means: “Sauce from Puebla”. Puebla is a mountain city in Mexico which is considered as the home region of the special sauce. What’s typical for the Mole Poblano? What’s not… The sauce brings together some odd flavors yet leading to a superb sauce with body. Think of hot peppers, cinamon, nuts and bitter chocolate! I guess I get your attention now! Disclosure: "This post contains affiliate links. All opionions shared are my own." The specific combination of flavors speaks to the imagination. However nobody exactly knows how the sauce was invented the wildest hypothesis go around. Some say the Aztecs created these sauce long time ago. Historians on the other hand doubt this considering the religious importance of chocolate to the Aztecs. Putting it in a sauce might have been Blasphemy. Moreover the city of Puebla has no Aztec foundations (source Mexonline). So who will tell the truth? Or will it stay a mystery forever? I’m somewhat curious to find out since it’s a special sauce with an interesting complex flavor palate. 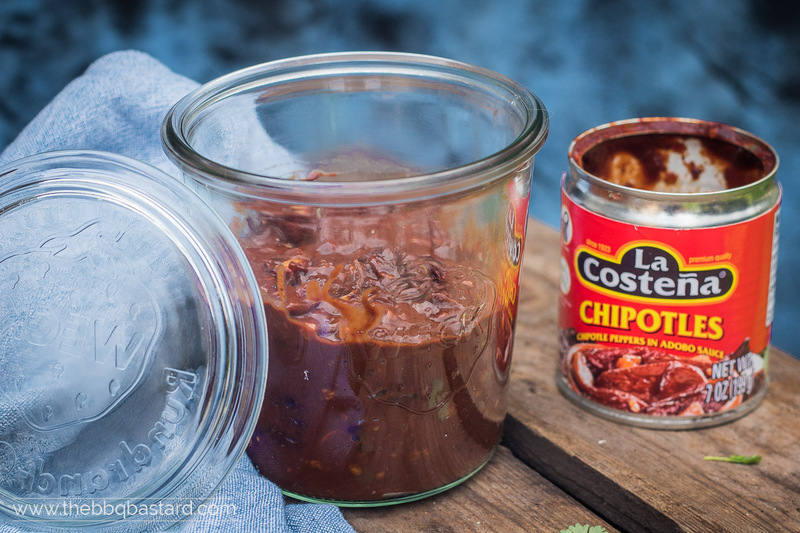 This BBQ sauce is based on the traditional Mole Poblano BBQ sauce. I reduced the ingredients and cooking time to make this sauce more accessible for backyard chefs like us. To stay as traditional as possible you need at least the chili peppers, bitter chocolate, nuts and spices used in this recipe. This combination leads to a spicy full bodied BBQ sauce that counters it’s own heat with the bittersweet chocolate flavor. The nuts just make the sauce complete. I opted for chipotle in adobo to add some smokiness and used the BBQ Sauce for burgers I will share as soon as possible. Stay tuned for the Mexican burger madness! Btw: there’s something great about smoked chocolate! Try it soon! I bet you will love it! But it doesn’t stop with burgers! You might also want to try this sauce on turkey like the traditional mole poblano is used to be served. Yet it tastes awesome on chicken and pork too. Try it on ribs or pork cheeks… Hey maybe even pulled pork. When you do please tell us all about it on Facebook or the comment section below! It’s always great to hear some BBQ stories from other firepit addicts. Mole Poblano: The Mexican nr. 1 classic serves perfect for a BBQ sauce! With the chili in adobo you get some nice heat countered by the dark and bitter chocolate. Add some tomatoes and spices and you get a nice sauce that fits almost everything! Add the olive oil to a sauce pan. Add the spices and let them cook for 2-3 minutes so they can release their fragrance. Add the onions and garlic and cook until translucent. Chop the tomatoes and add to the onions. Roughly cut the chipotle in adobo and add it to the saucepan together with the adobo sauce from the can. Add 1 cup ketchup and cook through. Roughly chop the dark chocolate and toss it in the sauce. Stir until the chocolate has molten. Taste the sauce and add salt, pepper and cider vinegar to taste. Let cook for 10 minutes minimum. The longer the sauce softly reduces the better it will get. Roughly chop the peanuts and brown them in a pan. Add them to the sauce in the end. Serve with some delicious burgers, chicken and probably even ribs. 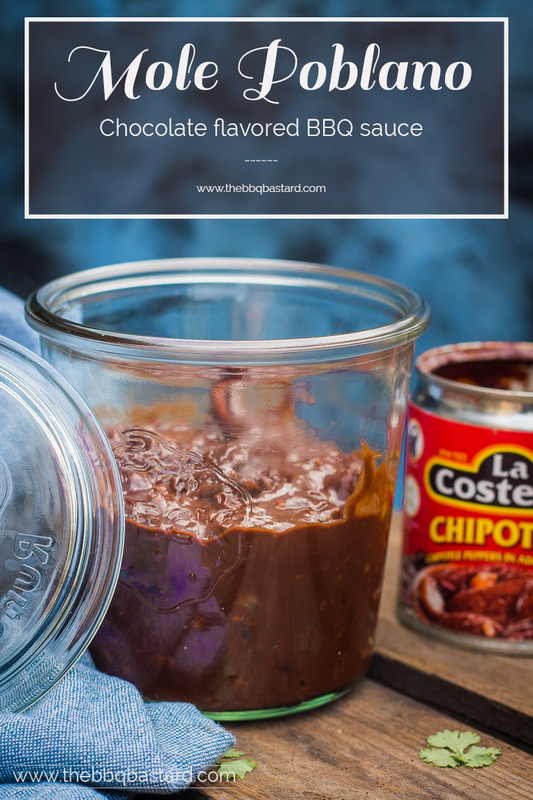 This spicy chocolate flavored BBQ sauce is delicious! - There are affiliate links on the "Chili In adobo" and "Dark chocolate"